"In Texas, Trump University Shut Down After State Scrutiny" was first published by The Texas Tribune, a nonprofit, nonpartisan media organization that informs Texans — and engages with them — about public policy, politics, government and statewide issues. Long before Trump University fell in the crosshairs of Democratic presidential frontrunner Hillary Clinton, one of Donald Trump's fellow Republicans drew a bead on the now-defunct school: Texas Gov. Greg Abbott. Abbott, then the state's attorney general, opened an investigation into the real-estate seminar business in 2010 raising many of the issues now reverberating in the white-hot race for the White House. Trump University ultimately closed up shop in Texas, leaving in its wake an untold number of people like Steven Branton of Mesquite — former students who were enticed by the Trump brand, only to discover a program wrought with high-pressure sales tactics and unfulfilled promises. "It was just nonsense — I don't know how else to say it," Branton said, recalling how one of the seminars he went to seemed to take advantage of attendees who were not as financially able to afford them as he was at the time. "There were people in that room — I guarantee you, they were talking about giving him everything they had." Trump has fiercely defended the school against persistent criticisms from Clinton, who said Wednesday the billionaire "is trying to scam America the way he scammed all those people at Trump University." He has said he will prevail in class-action lawsuits against the business and on Thursday took his confidence a step further, pledging to re-open Trump University if he becomes president. In Texas, the Trump University probe was never fully fleshed out after the school quickly pulled out of the state. But in at least one letter to Trump's attorneys, Abbott's office said it found the promises the school was making to its students "virtually impossible to achieve." A former deputy chief of Abbott's consumer protection division, John Owens, claims that his bosses nixed a request to sue Trump University for illegal business practices. A memo dated May 11, 2010, and provided to the Tribune and other news organizations, shows that Owens and his colleagues wanted to ask Trump University for a $5.4 million settlement. "It was swept under the rug, and the consumers were left with no one to go to bat for them," Owens told The Texas Tribune. "The Texas Attorney General's office investigated Trump U, and its demands were met — Trump U was forced out of Texas and consumers were protected," responded Abbott spokesman Matt Hirsch. More than three years after Trump University effectively ceased operations in Texas, Trump made two contributions to Abbott's gubernatorial campaign, one for $25,000 in July 2013 and the other for $10,000 in May 2014. To this day, the donations to Abbott represent Trump's only substantial foray into Texas politics — and enduring fodder for Abbott critics like the state Democratic Party, which charged Thursday that the governor is "on the corrupt Trump payroll." In a statement Thursday, hours after the Associated Press published a story drawing new attention to the donations, Abbott's office brushed off the conspiracy theory. "The unthinkable has happened — the media’s obsession with Donald Trump is now leading them to highlight the job then-Attorney General Abbott did in protecting Texas consumers," Hirsch said. A full-page ad in the Houston Chronicle on Sept. 24, 2009, exclaimed that the "time to invest in Texas real estate is NOW!" Encouraging readers to attend a free "investor workshop" — four were scheduled each day from Sept. 27-30 throughout the Houston area — the ad said students can "learn from Donald Trump's handpicked experts how you can profit from the largest real estate liquidation in history." “He’s the most celebrated entrepreneur on earth," the ad read. "He’s earned more in a day than most people do in a lifetime. He’s living a life many men and women only dream about. And now he’s ready to share — with Americans like you — the Trump process for investing in today’s once-in-a-lifetime real estate market." Abbott's office began probing Trump University in 2010, after Texas-based Better Business Bureaus reportedly received 30 complaints about the school in the previous two years. In a letter dated Jan. 6, 2010, Assistant Attorney General Rick Berlin asked Trump University to produce a slew of documents, including teaching and promotional materials, as well as a detailed list of customers and "any such evidence that such person successfully implemented your methods." Abbott's office seemed particularly interested in Steven Goff, a Texan who was among Trump University's most prominent instructors. The January 2010 letter named Goff twice, asking for "all professional licenses and registrations" held by him and "all documents related to any real estate contracts" negotiated by him. Goff did not respond to messages seeking comment Thursday. In a deposition later taken in one of the class-action lawsuits against Trump University, Trump was asked if Goff and others were qualified to serve as instructors. "I don't know who they are," the billionaire repeatedly responded, according to a transcript of the deposition released earlier this year. Trump's team sought — and received — a one-month extension of Berlin's Feb. 1 deadline to turn over the documents, according to correspondence obtained by the Democratic super PAC American Bridge under an open-records request. During that time, Berlin asked Trump lawyer Sam Stubbs about the status of Trump University classes in Texas, to which Stubbs responded that the school had "indefinitely postponed all Texas free presentations, which are designed to find and sign up seminar customers, and will not conduct any three-day seminars in Texas, until the issues your office has raised have been addressed." It appears Berlin ultimately received at least some of the materials he sought. In an email dated March 5, Stubbs told Berlin he had enclosed a DVD and CD with the materials, while in a June 17 message to the Texas Real Estate Commission, Berlin asked it to vet class materials provided by a former student. "Anything that appears illegal or misleading would be particularly interesting," Berlin wrote. In a May 19 email to Berlin, Trump lawyer Michelle Lokey provided an extensive defense of the school's operation in Texas, saying it has found "no set of facts that would form the basis of a deceptive trade practices act violation here." Lokey touted high customer ratings of the programs — 96-97 percent on average — and chalked up negative attention to "some spurious blog posts on the internet that are a consequence of doing business in this industry" and being associated with a "very public figure" like Trump. Berlin responded to Lokey's email three weeks later, saying the two "obviously see this case very differently." "Essentially what Trump U promises is virtually impossible to achieve," Berlin told Lokey. "The audience Trump U targets for the initial workshop is the real estate novice. In effect, Trump U promises to teach these novices everything they need to know to be a successful residential real estate broker -- in 3 days. In Texas, to become licensed as a real estate broker you must have 900 hours of classroom instruction and 2 years selling experience. The extensive training is required for good reason: to protect the public." "In addition to encouraging unlicensed activity (which is a misdemeanor in Texas), the course materials in a number of respects are simply wrong under Texas law," Berlin wrote later in the email. "In short, we continue to have serious concerns about the course materials as well as the marketing and sales tactics used by Trump U in Texas." It is not entirely clear how the probe was ultimately resolved. In a response to one of the lawsuits now facing Trump University, Trump's side said Abbott ultimately "dropped his investigation" — but denied that the school ever "'suspended' 'Live Events in Texas,'" as Stubbs suggested it did in his response to Berlin during the probe. A spokesperson to now-Attorney General Ken Paxton declined to comment on the record Thursday. Included in the correspondence are dozens of letters from Berlin to Trump University customers, including Branton, asking to speak with them by phone about their experience with the school. One of the former customers shared a story similar to Branton's: experiencing aggressive sales tactics, spending a few thousand dollars for the entry-level courses and bailing when it was clear it was not worth it. "They say they’re going to tell you everything, and they don’t tell you everything unless you continue to purchase programs," said the customer, who did not want to be identified. "It was extremely high pressure." "I wish I could get my money back, that's for sure," the customer added. "If I had to grade it ... I would say it failed." Not every Texan who enrolled in Trump University had a negative experience. Among the thousands of pages in litigation against the school are glowing testimonials and surveys from some students, including Stephen Nesbit of Dallas, who said he signed up for Trump University around November 2009 after receiving an advertisement in the mail to attend a free seminar. At the time, Nesbit had been running a software company and had no experience in real estate investment. The classes helped him make his first offer to buy a property in 2009 and an actual purchase a month later, he said. He would go on to make offers on nearly 20 properties and purchase about half. "Trump University did a great job of exposing me to the many possible ways to invest in real estate, and how to make money at it," Nesbit wrote. "They give you the fundamental base level knowledge that you need, and if you execute it on your own and apply it to the markets you choose, which is how it should be, then you can make things happen." As for Branton, the onetime student said he was not deterred by his Trump University experience. He went on to learn about real estate investment through other avenues and now has six investment properties in the Dallas area. "I'm totally happy," he said Thursday, reflecting on his escape from Trump University. "My retirement is secure." In Texas, Trump University Shut Down After State Scrutiny By Patrick Svitek June 2, 2016 Long before Trump University fell in the crosshairs of Democratic presidential frontrunner Hillary Clinton, one of Donald Trump's fellow Republicans drew a bead on the now-defunct school: Texas Gov. Greg Abbott. Abbott, then the state's attorney general, opened an investigation into the real-estate seminar business in 2010 raising many of the issues now reverberating in the white-hot race for the White House. Trump University ultimately closed up shop in Texas, leaving in its wake an untold number of people like Steven Branton of Mesquite — former students who were enticed by the Trump brand, only to discover a program wrought with high-pressure sales tactics and unfulfilled promises. "It was just nonsense — I don't know how else to say it," Branton said, recalling how one of the seminars he went to seemed to take advantage of attendees who were not as financially able to afford them as he was at the time. "There were people in that room — I guarantee you, they were talking about giving him everything they had." Trump has fiercely defended the school against persistent criticisms from Clinton, who said Wednesday the billionaire "is trying to scam America the way he scammed all those people at Trump University." He has said he will prevail in class-action lawsuits against the business and on Thursday took his confidence a step further, pledging to re-open Trump University if he becomes president. &nbsp; In Texas, the Trump University probe was never fully fleshed out after the school quickly pulled out of the state. But in at least one letter to Trump's attorneys, Abbott's office said it found the promises the school was making to its students "virtually impossible to achieve." A former deputy chief of Abbott's consumer protection division, John Owens, claims that his bosses nixed a request to sue Trump University for illegal business practices. A memo dated May 11, 2010, and provided to the Tribune and other news organizations, shows that Owens and his colleagues wanted to ask Trump University for a $5.4 million settlement. "It was swept under the rug, and the consumers were left with no one to go to bat for them," Owens told The Texas Tribune. "The Texas Attorney General's office investigated Trump U, and its demands were met — Trump U was forced out of Texas and consumers were protected," responded Abbott spokesman Matt Hirsch. More than three years after Trump University effectively ceased operations in Texas, Trump made two contributions to Abbott's gubernatorial campaign, one for $25,000 in July 2013 and the other for $10,000 in May 2014. To this day, the donations to Abbott represent Trump's only substantial foray into Texas politics — and enduring fodder for Abbott critics like the state Democratic Party, which charged Thursday that the governor is "on the corrupt Trump payroll." A 2009 newspaper ad for Trump UniversityHouston Public Library Archives In a statement Thursday, hours after the Associated Press published a story drawing new attention to the donations, Abbott's office brushed off the conspiracy theory. "The unthinkable has happened — the media’s obsession with Donald Trump is now leading them to highlight the job then-Attorney General Abbott did in protecting Texas consumers," Hirsch said. Trump U arrives in Texas A full-page ad in the Houston Chronicle on Sept. 24, 2009, exclaimed that the "time to invest in Texas real estate is NOW!" 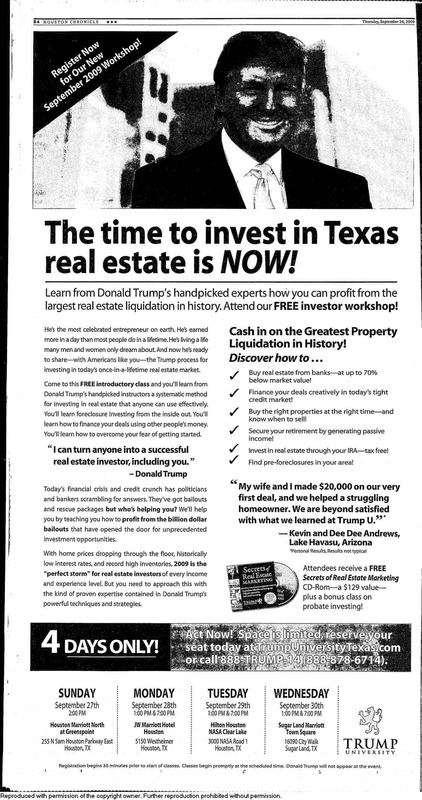 Encouraging readers to attend a free "investor workshop" — four were scheduled each day from Sept. 27-30 throughout the Houston area — the ad said students can "learn from Donald Trump's handpicked experts how you can profit from the largest real estate liquidation in history." “He’s the most celebrated entrepreneur on earth," the ad read. "He’s earned more in a day than most people do in a lifetime. He’s living a life many men and women only dream about. And now he’s ready to share — with Americans like you — the Trump process for investing in today’s once-in-a-lifetime real estate market." Abbott's office began probing Trump University in 2010, after Texas-based Better Business Bureaus reportedly received 30 complaints about the school in the previous two years. In a letter dated Jan. 6, 2010, Assistant Attorney General Rick Berlin asked Trump University to produce a slew of documents, including teaching and promotional materials, as well as a detailed list of customers and "any such evidence that such person successfully implemented your methods." Abbott's office seemed particularly interested in Steven Goff, a Texan who was among Trump University's most prominent instructors. The January 2010 letter named Goff twice, asking for "all professional licenses and registrations" held by him and "all documents related to any real estate contracts" negotiated by him. Goff did not respond to messages seeking comment Thursday. In a deposition later taken in one of the class-action lawsuits against Trump University, Trump was asked if Goff and others were qualified to serve as instructors. "I don't know who they are," the billionaire repeatedly responded, according to a transcript of the deposition released earlier this year. Trump's team sought — and received — a one-month extension of Berlin's Feb. 1 deadline to turn over the documents, according to correspondence obtained by the Democratic super PAC American Bridge under an open-records request. &nbsp; During that time, Berlin asked Trump lawyer Sam Stubbs about the status of Trump University classes in Texas, to which Stubbs responded that the school had "indefinitely postponed all Texas free presentations, which are designed to find and sign up seminar customers, and will not conduct any three-day seminars in Texas, until the issues your office has raised have been addressed." It appears Berlin ultimately received at least some of the materials he sought. In an email dated March 5, Stubbs told Berlin he had enclosed a DVD and CD with the materials, while in a June 17 message to the Texas Real Estate Commission, Berlin asked it to vet class materials provided by a former student. "Anything that appears illegal or misleading would be particularly interesting," Berlin wrote. In a May 19 email to Berlin, Trump lawyer Michelle Lokey provided an extensive defense of the school's operation in Texas, saying it has found "no set of facts that would form the basis of a deceptive trade practices act violation here." Lokey touted high customer ratings of the programs — 96-97 percent on average — and chalked up negative attention to "some spurious blog posts on the internet that are a consequence of doing business in this industry" and being associated with a "very public figure" like Trump. Berlin responded to Lokey's email three weeks later, saying the two "obviously see this case very differently." "Essentially what Trump U promises is virtually impossible to achieve," Berlin told Lokey. "The audience Trump U targets for the initial workshop is the real estate novice. In effect, Trump U promises to teach these novices everything they need to know to be a successful residential real estate broker -- in 3 days. In Texas, to become licensed as a real estate broker you must have 900 hours of classroom instruction and 2 years selling experience. The extensive training is required for good reason: to protect the public." "In addition to encouraging unlicensed activity (which is a misdemeanor in Texas), the course materials in a number of respects are simply wrong under Texas law," Berlin wrote later in the email. "In short, we continue to have serious concerns about the course materials as well as the marketing and sales tactics used by Trump U in Texas." And then it leaves It is not entirely clear how the probe was ultimately resolved. In a response to one of the lawsuits now facing Trump University, Trump's side said Abbott ultimately "dropped his investigation" — but denied that the school ever "'suspended' 'Live Events in Texas,'" as Stubbs suggested it did in his response to Berlin during the probe. A spokesperson to now-Attorney General Ken Paxton declined to comment on the record Thursday. “Essentially what Trump U promises is virtually impossible to achieve.”— Rick Berlin, assistant attorney general, in 2010 email to a Trump lawyer Included in the correspondence are dozens of letters from Berlin to Trump University customers, including Branton, asking to speak with them by phone about their experience with the school. One of the former customers shared a story similar to Branton's: experiencing aggressive sales tactics, spending a few thousand dollars for the entry-level courses and bailing when it was clear it was not worth it. "They say they’re going to tell you everything, and they don’t tell you everything unless you continue to purchase programs," said the customer, who did not want to be identified. "It was extremely high pressure." "I wish I could get my money back, that's for sure," the customer added. "If I had to grade it ... I would say it failed." Not every Texan who enrolled in Trump University had a negative experience. Among the thousands of pages in litigation against the school are glowing testimonials and surveys from some students, including Stephen Nesbit of Dallas, who said he signed up for Trump University around November 2009 after receiving an advertisement in the mail to attend a free seminar. At the time, Nesbit had been running a software company and had no experience in real estate investment. The classes helped him make his first offer to buy a property in 2009 and an actual purchase a month later, he said. He would go on to make offers on nearly 20 properties and purchase about half. "Trump University did a great job of exposing me to the many possible ways to invest in real estate, and how to make money at it," Nesbit wrote. "They give you the fundamental base level knowledge that you need, and if you execute it on your own and apply it to the markets you choose, which is how it should be, then you can make things happen." As for Branton, the onetime student said he was not deterred by his Trump University experience. He went on to learn about real estate investment through other avenues and now has six investment properties in the Dallas area. "I'm totally happy," he said Thursday, reflecting on his escape from Trump University. "My retirement is secure." "In Texas, Trump University Shut Down After State Scrutiny" was first published at by The Texas Tribune, a nonprofit, nonpartisan media organization that informs Texans — and engages with them — about public policy, politics, government and statewide issues. Link back to the original article, which is located at https://www.texastribune.org/2016/06/02/abbott-trump-u/.